The Vein, a river of blood and death that wends its way through the landscape, brings death and pestilience to the surrounding area. 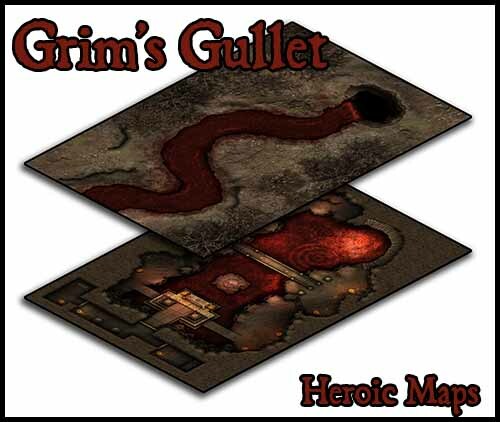 The river eventually vanishes underground through a chasm known locally as Grim’s Gullet. Most people avoid the river and Grim’s Gullet entirely, but some others have made the location a place of worship. Hugging the walls of the chasm, stone steps lead down to a lake of blood, watched by dozens of huge carved stone skulls. A sacrificial altar stands before a series of antechambers. 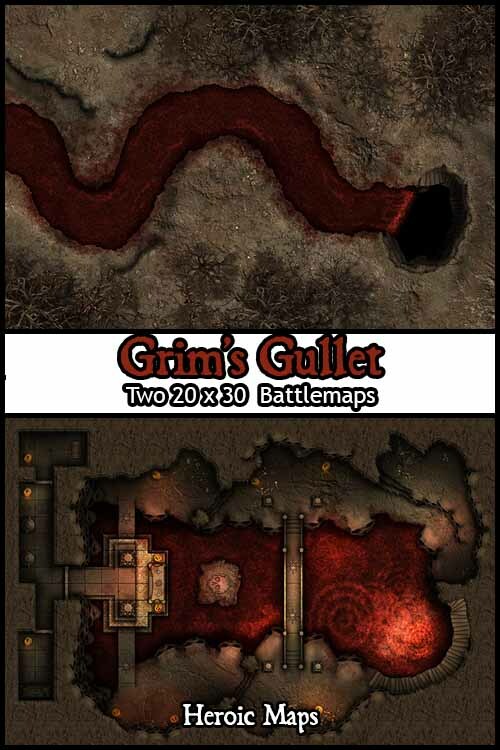 Grim’s Gullet is a set of printable dungeon floorplans compatible with any RPG/Dungeon-Crawl game. It can be used as a standalone gameboard, or combined with any same-scale tileset. Surface – A thick river of blood meanders through a wasted landscape, with dead trees and lifeless rock. Cave – Reached by a set of steps that wind down from the surface, the cave is dominated by a large lake of blood, crossed by a bridge and worshiped via an altar. Huge stone skulls are carved into the walls of the cavern.